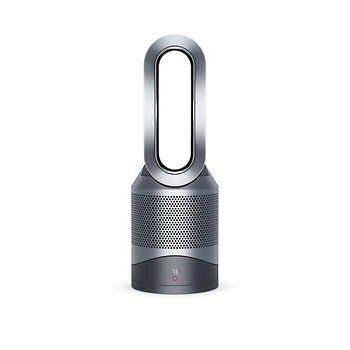 Product Details The Dyson Pure Hot+Cool purifier heater has triple functionality. It quickly heats the whole room in winter, keeps you cool as a fan in summer, and purifies all year round. As a purifier, it removes 99.97% of allergens as small as 0.3 microns from your home including mold, pollen, bacteria and pet dander. Its 360 , vacuum-sealed glass HEPA filter also helps capture odors and harmful toxins. And whether heating or cooling, Jet Focus Control lets you select personal mode for a powerful stream of focused air, or diffused mode for wide projection. The machine also features a sleep timer and an easy-to-clean aperture. Features: 3-in-1 Heater, Fan and Purifier (Non Wifi Compatible) Intelligent Thermostat Maintains Temperature Tilt, Oscillation, & Sleep Timer HEPA Filter Automatically Purifies To Remove Allergens and Pollutants Made in Malaysia Accessories: Remote control magnetized to store on the machine 360 Glass HEPA filter Room Size Range: Small Material: Plastic Number of Fan Speeds: 1-10 Cord Length: 6 Wattage or Volts Required: 120V Battery: CR2032L coin cell Certifications: ETL, AAFA, Quiet Mark Dimensions: W (27.13 ) x D (10.23 ) x H (10.23 ) Warranty: All Dyson purifiers are covered for 2 years parts and labor warranty.